Snails are members of the Mollusc family. More than a thousand different species of snail exist and these creatures can be found all across the globe, on land, in the sea and in freshwater environments. It has been proven that snails sleep, but their sleeping habits are unusual compared to those of most larger and more developed animals. Snails inhabit every continent on Earth, possibly excluding Antarctica, although some sea snails may inhabit its surrounding waters. They vary greatly in size, from the tiny land snail Punctum minutissimum to the giant sea snail Syrinx aruanus, whose shell can measure roughly 30 inches in length. Although all snails are hermaphrodites—possessing both male and female sexual organs—they need to mate to fertilize their eggs. In 2011, results were published from research carried out at the University of Toronto, confirming that snails do sleep. The researchers checked that the snails really were sleeping, rather than just resting, by measuring their response time to stimuli, such as being tapped on the shell or being presented with food. Some snails were observed for 79 days so researchers could get some insight into their sleeping patterns. Data from the University of Toronto research showed that snails have a very different sleep cycle from people. Rather than being part of a 24-hour day, their sleep cycle lasted two to three days. 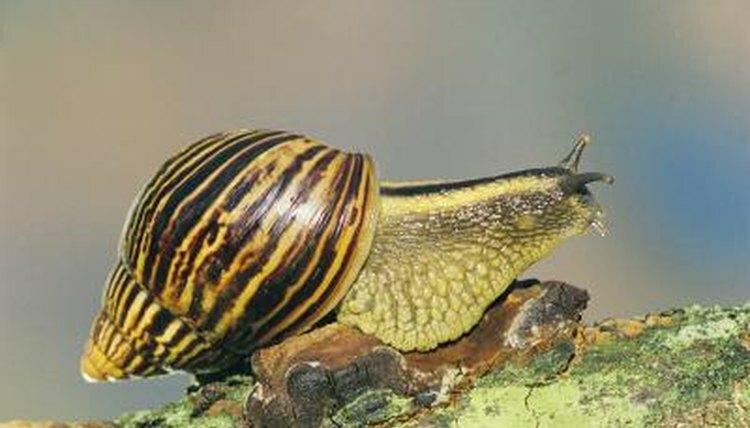 Over a period of 13 to 15 hours, snails sleep in around seven bouts. This sleeping period is followed by roughly 30 hours of activity. If they lose sleep during their normal sleeping period, they seemingly have no need to make up for it. In addition to their day-to-day sleeping habits, snails also go into a deep sleep to avoid adverse weather conditions and periods when food is scarce. In colder climates they hibernate during the winter months, and in hotter climates they estivate during the summer months. When they go into hibernation or estivation, they seal themselves safely inside their shells with a layer of mucus that forms a hard cover over the opening. How Do Snails Keep a Tank Clean?